Sharing this roast with you today has me feeling an array of emotions. I developed this recipe in early November because I wanted to do something different for Christmas dinner this year. I do not know about you, but by the time Christmas rolls around I am done with turkey! I was excited to make this for my in-laws for Christmas dinner and then something strangely wonderful happened – I got a phone call with my surgery date! To fill you in, I have been spending the last few months going through dozens of steps to prepare for Roux-en-Y Gastric Bypass surgery. It was a HUGE decision that I weighed off and on for over two years. I have struggled with being overweight since college, falling into the “morbid obesity” weight category shortly thereafter. With a double-sided family history of heart disease and failure at dozens of diets and “lifestyle changes”, it was a recent diagnosis of sleep apnea that gave me the push I needed to make a permanent change in my life. I have been waiting for weeks for the insurance company to send their final approval to my surgeon and the other day I got a call that January 3rd will be my surgery date. I cannot be more excited but let me tell you, there has been a whirlwind of emotions that I’ve experienced since getting that call. On December 21st (my birthday!) I begin the required 2-week long liver shrinking diet, which consists of only clear liquids. That means the typical birthday celebration, Christmas sweets and dinner and the New Years Eve glass of champagne are all off the table. I also decided that I should not be cooking Christmas dinner as initially planned simply because I do not want the temptation. So while the family enjoys their dinner I will be sipping my bone broth or crunching on a sugar free popsicle. I know the end result will be worth it but it certainly does bring a sense of sadness and “I can’t have that”. Realizing that food is the center of many holidays and celebrations is just one of the many emotional and mental changes that occur for bariatric surgery patients. 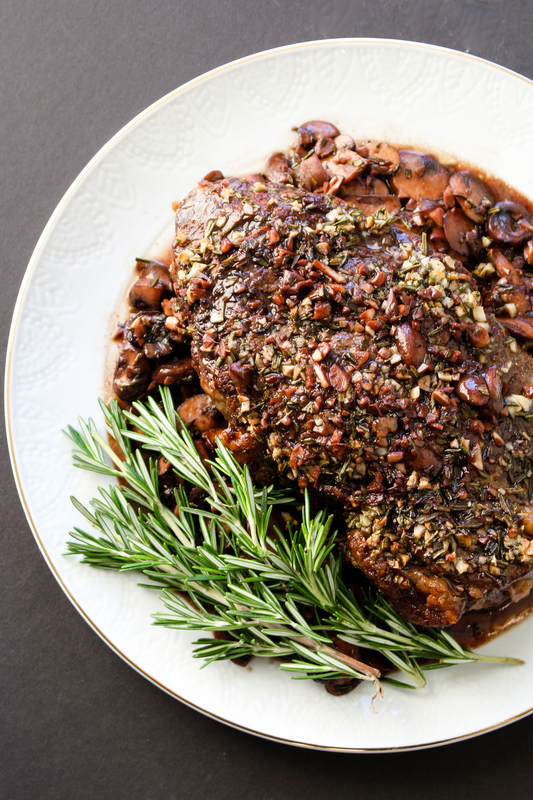 While this year will be extremely difficult, knowing that next year I may be able to enjoy a couple ounces of this gluten-free, paleo-friendly ribeye roast give me hope and helps to keep my focus on the many positive things I am gaining on this journey. Note: You can buy pre-peeled, fresh garlic in the produce section of most stores if you do not want to do it yourself. Do not use jarred, prepared or pre-chopped garlic. It does not taste like fresh garlic and easily becomes burnt and bitter during roasting. 2. 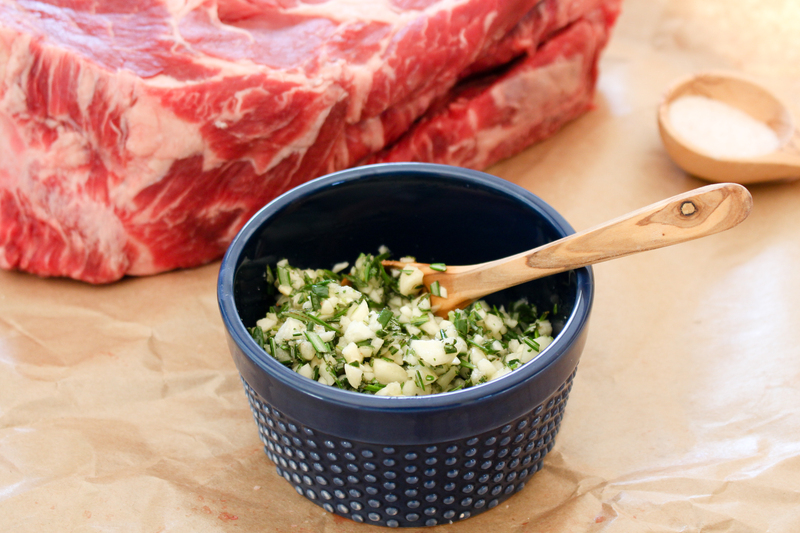 To make the rub, peel the garlic cloves and coarsely chop. Add rosemary leaves, half the salt and pepper to the cutting board and chop until everything is well combined. Add to a small bowl and mix with the half of the olive oil. Set aside. 3. Heat a large cast iron skillet or enameled cast iron pot over medium-high heat. Rub the ribeye roast with the remaining olive oil and salt. Sear all sides of the roast for 1-2 minutes until they are nice and brown. 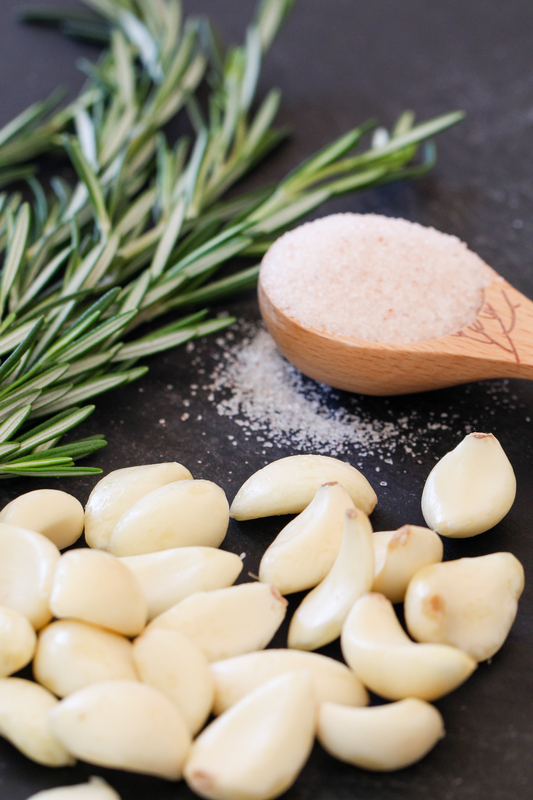 Rub the rosemary garlic mixture over the roast and insert an oven-safe probe thermometer. Roast approximately 15-20 minutes per pound until the internal temperature reaches 135 degrees (for medium rare). Once desired temperature is reached, place roast on a clean cutting board. Loosely cover it with foil to retain heat while it rests. 4. To make sauce, heat the pan drippings from the skillet over medium heat. Add mushrooms and sauté 5 minutes. Add the wine and beef stock and slowly simmer for 20 minutes, until it reduces and thickens. Turn off the heat and add butter to make it silky. This entry was posted in Beef, Christmas, Dairy Free, Gluten Free, Uncategorized and tagged christmas, roast, steak. Bookmark the permalink.